Lawn mowers come in two different varieties when it comes to propulsion: push and self-propelled. Push mowers are best for yards under a quarter acre with flat terrain. Self-propelled mowers are great for yards over three-quarters of an acre. Push mowers have the ability to cut grass like it was done with a pair of scissors. In contrast, typical power rotary mowers have spinning blades that cut the grass like a helicopter blade. There are a plethora of options out there to choose from. This buying guide will explain the benefits of using them, features to consider when purchasing, and reviews to help you find the best push mower. Power rotary mowers chop and tear grass, leaving it vulnerable to disease and insect attacks. 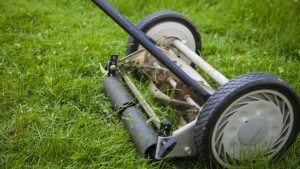 Grass cut with a reel mower heals faster and is less likely to suffer from illness and pests. 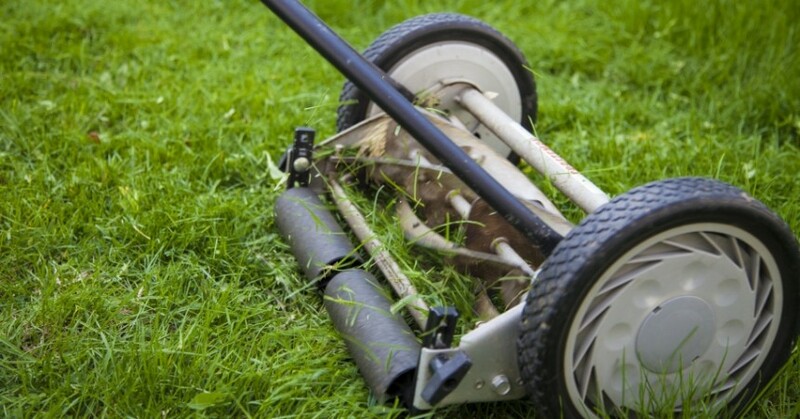 They utilize a scissor-like way to cut grass, making your grass look clean and evenly cut. Notice how grass at baseball stadiums and golf courses look so nice? That’s because the landscapers use real mowers pulled by tractors to achieve that professionally manicured look. Since they are motorless, it’s definitely not as loud as it’s rotary mower counterparts. With these babies, you can cut your grass early in the morning or late at night without the neighbours complaining. If a gas-powered lawn mower is used for one hour, it emits as much air pollution as a sedan driven for two hundred miles. A push mower emits zero, making it a better choice for those who are eco-conscious. Due to its simplicity in design, they do not require continuous maintenance with gas, oil, and spark plugs. In fact, the only maintenance required is the rare blade sharpening. Convinced that you need to buy one? Finding the best option for you and your household can be challenging. Educate yourself on the features different models have to offer. Because they are propelled by human energy, weight is a significant consideration. For smaller or older people, or those who are not in the best shape, we recommend choosing a reel mower that’s on the lighter side. A mower with a large cutting width means a heavier mower. However, mowers with large cutting widths allow the user to mow their lawn with fewer passes and in less time. Weigh in on the pros and cons and choose the best cutting width for you. They either spray the grass behind the mower or in front of it. The superior option is to spray in front, since the other choice leaves your feet covered with grass clippings. Some newer models offer grass catcher for convenient cleanup. It is important to be able to choose the height in which your mower cuts the grass, for the health of the grass. Important questions to ask are: Can the cutting blade adjust up or down? What is the cutting height range? And how do you adjust the cutting height? They are eco-friendly alternatives to gas-powered mowers. They are quieter, require little maintenance, and cut even better than rotary mowers. Buying one does not have to be stressful. Use these reviews and the above features to find the best model for your lawn’s needs. This StaySharp model received the Popular Mechanics 2010 Green Design Award and is Consumer Report’s top choice. It features a combination of advanced technologies that make it 60% easier to push than others, patent-pending InertiaDrive Reel that delivers twice the cutting power that would jam others, StaySharp Cutting System that uses precision-ground, hardened steel blades which reduces friction and blade wear for long-lasting performance, patent-pending VersaCut Technology that offers a cutting height range between 1 to 4 inches, inset wheel design that allows the blades to pass through the full width of the mower for the ability to cut closer to foundations, fences and borders, and unique grass discharge chute that throws clippings forward. This mower can cut through all grass types, even tough ones and comes with a limited three-year warranty. The Fiskars StaySharp Max is one of the best-selling mowers on the market for a reason. With its innovative design, it offers a forward grass spray and a higher cutting height maximum than any other. Although it doesn’t handle tall grass quite as well, it pushes smoothly and easily, but takes more effort to turn due to its bulkiness. The Gardena 4023 has a contact-free cutting system that is extremely quiet and easy to move. It features a 15” cutting width, a hardened, non-stick coating cutting cylinder made of steel, a ground bottom blade, easy and infinitely-variable cutting height adjustment using a controller, a removable handle for compact storage and transportation, and weighs in at under 18 lbs. It is easy to assemble and should take no more than 10 minutes. It also cuts grass as well as most of its competitors. During tests, its hand cylinder did not jam. However, the adjusting the cutting height could be simplified. The American 1204-14 features a cutting width of 14”, a cutting height between 0.5 to 1.5 inches, 8.5” high impact polymer wheels with integral moulded tread, three-spider one-blade reel, an alloy steel reel, a bed knife blade, and an adjustable, three-section roller. This mower has a zinc-plated handle with plastic grips for comfort. It weighs in at 19 lbs and comes with a limited 90-day warranty. The American 1204-14 provides precision cutting for most turf grasses, unlike most of its competitors. 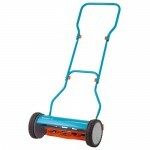 This mower is easy to manoeuvre, lightweight, easy to use and store, quiet, and has low maintenance costs. However, it does not cut through twigs very well unless you attack them with speed and momentum. Taller grass tends to get stuck in the mower and jam it up. Lastly, if the assembly is done incorrectly, some bolts may loosen and fall out. The Great States 415-16 features a 16” cutting width, 10” ball bearing wheels, easy height adjustment with a cutting height range between 0.5 to 2.75 inches. The handle is finished with a powder coat to last longer and prevent rust. Heat-treated blades will stay sharp longer. The Great States 415-16 is very easy to move, is quiet, requires very low maintenance since its blades stay sharp for years, easy to assemble with no tools required, and compact. However, the mower itself is not very light, the handle is difficult to attach, and it has difficulty cutting through very tall grass. The Great States 204-14 features a 14” cutting width, alloy steel reel and bed knife blade, a cutting height adjustable from 0.5 to 1.5 inches, steel side plates, and 8.5” polymer wheels. The Great States 204-14 is lightweight, easy to manoeuvre, and sturdy. However, like its reel mower counterparts, it has problems cutting thick or tall grass. Also, twigs and pine cones tend to jam the mower, requiring the user to manually remove these obstacles from its blades. The Scotts 2000-20 is touted as being able to cut tall grass better than any other reel mower on the market. It features a 20” cutting width, a height range from 1 to 3 inches, quick-snap height adjusters for up to 9 different settings, dual 6” rear tracking wheels, 10” radial tread tires for good traction and durability, heat-treated blades for longevity, a comfortable foam-grip handle, 5-blade reel rotates on ball bearings attached with 5 spider mounts for rigidity, a welded reel hood to protect bushes and plants from the blades, a 2-year manufacturer’s warranty, and weighs 30 lbs. The Scotts 2000-20 offers a good range in cutting height, is easy to adjust the height, has the ability to mow a wide swath of grass per pass, and has a very clean cutting ability. 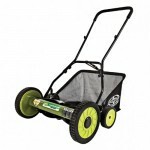 It can even handle taller grass and cuts grass more thoroughly than other reel mowers, according to many user reviews. This reel mower is light and easy to manoeuvre, despite its wide cutting width. The GreenWorks 25052 features a 16” cutting path with steel helical-designed contact-free blades, 2-in-1 mulching and rear bag capabilities, a 4-position height adjustment with a cutting height range from 1 1/8 to 2 ¼ inches, 10” front wheels, 2” rear rollers and a 4-year warranty. The GreenWorks 25052 is easy to assemble with only a wrench needed to fasten a few nuts on the handle. The handle itself allows for horizontal or vertical grips and is very comfortable. The two large wheels make for a smooth push over uneven terrain. This mower is easy to manoeuvre around obstacles. The cutting ability is fairly good, but this reel mower does struggle a little bit in tall grass. Changing the cutting height is quite easy, however, the accompanying grass catcher does a bad job of catching grass clippings and falls off the machine quite often. The Mow Joe MJ501M features a cutting width of 18”, 9-position manual height adjustment with tailor cutting heights between 1.26 and 2.44 inches, 5 steel blades, a grass catcher with a capacity of 6.6 gallons, a comfortable foam handle, and a warranty of 2 years. This reel mower weighs in at 28 pounds. The Mow Joe MJ501M has two levers on each side of the mower that allows the user to determine the cutting height within 9 different positions. It is easy to assemble, stable and reliable. With this reel mower, it might take you a little bit longer to mow, but when you’re done, your lawn will look magnificent. Just remember to keep an eye on the clippings in your catcher, as some reviews note that it fills up quickly which may cause the mower to jam on its own grass clippings. This one is great for smaller lawns with few obstacles. 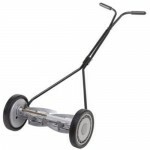 It features a 20” cutting width, 6 different height adjustments with a cutting height range between 1.33 to 2.5”, a 14” wide adjustable, foam-cushioned handle, 5 heat-treated steel-blade rotary system, 9.75” front rubber wheels, 6” back rubber wheels, and a removable grass catcher. It is lightweight, compact, and emits very little noise. Assembly takes no more than ten minutes. However, it is not made to shred leaves, mow yards with many trees, or cut twigs. With twigs, users will have to manually remove them from the blade. Some users complain that the grass catcher poorly does its jobs since the bag is too far from the blades. There’s also a few inches between the tire and the cutting blade, so users will have to overlap somewhat to get a good cut. Push reel mowers save the environment, your aural health, and your wallet. There are many types of reel mowers on the market. When considering one, keep in mind features such as weight, cutting width, the direction of grass spray, height adjustment and cutting height range, and pricing. With this buying guide and reviews, you will be well-informed when choosing the best push mower for you and your lawn needs. Looking for an electric mower? Read our top 10 electric lawn mower comparison here!